As it is not usually in Disney’s character to leave money on the table. My initial thought was that Disney missed the boat by not integrating a 2nd spell card series when booster packs were launched this past August. However the more I thought about it they obviously made the right decision. After the grand opening in February SotMK had already garnered a decent following, albeit mostly Disneyana collectors looking for the next big thing to horde or profit. The focus had quickly shifted from the game itself to the spell cards. After the temporary retirement of cards 61-70 from the free daily spell packs and no news of if and when they were to return. It was only a matter of time until eBay was the only place to get them. With a steady average of selling at $100+ per lightning bolt I could only assume that Disney had to realize they were onto something and knew they could profit. So there was the announcement, cards 61-70 would be available for purchase via a 7 card booster pack in which only one lightning bolt would be included. The other 6 would include a variation of cards available in the free packs given out at the Firehouse or Liberty Square. In addition to the cards, a home game was also introduced. Although most fans were initially very excited many were left disappointed at the lack luster and extremely confusing home game portion. Although the game boards & card checklist were a nice touch. The home game itself is terrible. But we’ll save that for another day. As I said earlier I did feel that the booster pack launch would have been a tremendous avenue for them to introduce a new series of cards. I realized it’s just too soon for that, the game isn’t even a year old. It hasn’t reached a large enough audience. Think about it, the booster packs aren’t for the “Veteran Sorcerer” or AP that goes multiple times a week. Don’t get me wrong most of us needed them to complete our sets and yes the main draw is the lightning bolt card. However the booster pack is really targeting the family who is just returning a year after its launch, heard about it online, or only visits WDW once maybe twice a year. They need to time to catch up. Disney knows that those guests can’t rely on the free packs to compete one set. As I am sure most kids want their own set of cards they need those booster packs. I’m sure the numbers don’t lie, the SotMK Booster Packs have got to be some of the most sought after theme park merchandise. Do I think we’ll see a 2nd spell card series? Absolutely. Give it time. 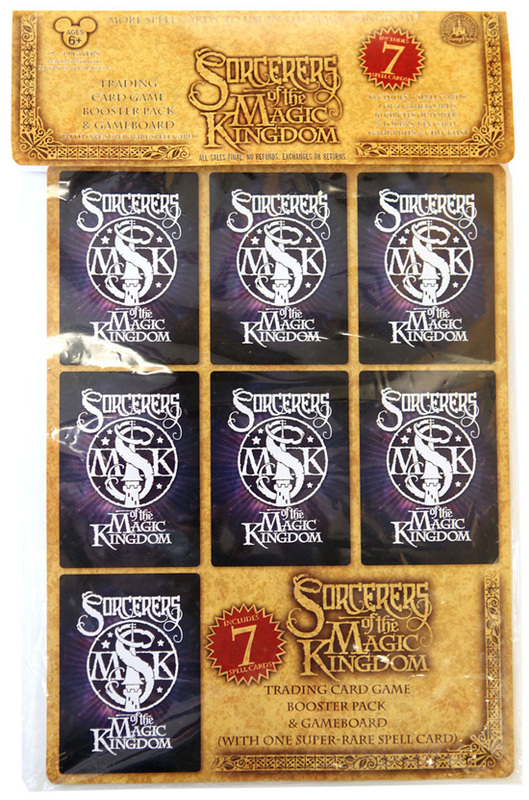 With the Emporium’s stock of SotMK Booster Packs being readily available, Sorcerers are scooping them up left and right. Even better news is that the packs have also been seen in Sir Mickeys. I have yet to see them anywhere besides the Emporium and Sir Mickeys however I have heard from a source that hotel gift shops should have them available soon. As wonderful as that is it appears there is some bad news that has come with this recent overload of stock. There are several reports of Sorcerers purchasing Booster Packs only to find that the pack does not include a coveted 61-70 spell card. As you can see in the photo above the packaging it clearly states that one super rare card is included. On the top it also reads “All Sales Final. No Refunds. Exchanges or returns.” You’re probably asking, what if this happens to me? What if my pack was tampered with by Hades? Here’s my suggestion, ask for a manager at the location you’ve purchased them at and explain the situation. If that doesn’t get you anywhere calmly head to Guest Relations and go from there. As for those who are purchasing them on the secondary market like eBay… Buyer beware! First of all I’d like to extend my deepest apologies for the lack of updates recently. It appears Hades has not only been wreaking havoc on the Magic Kingdom but he’s sidetracked me as well! So thank you for being patient and continuing to check out the blog! We’ve been working on making updates to the various pages on the site and in the coming days there will be several new posts filled with tips and maybe even a rumor or two! 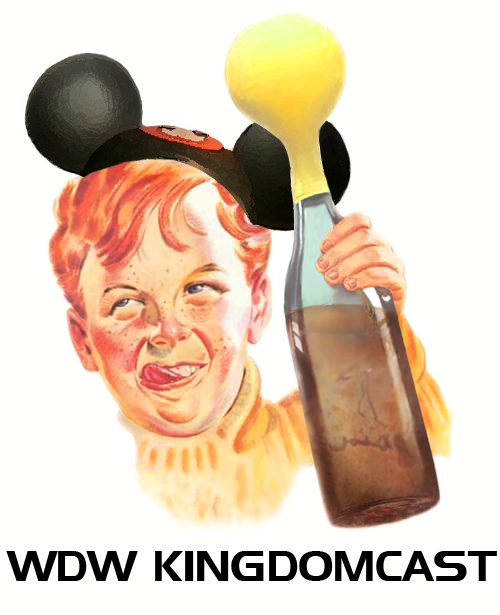 Thanks again for your continued support and best of luck in your journey to save the Magic Kingdom! 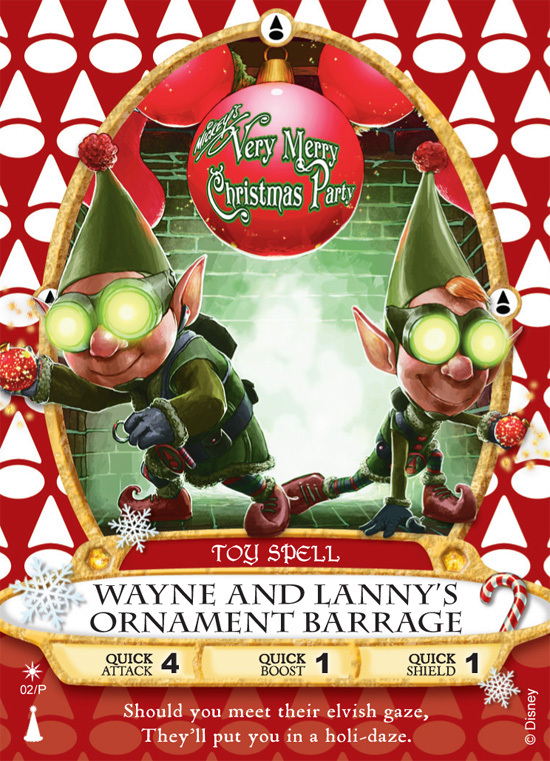 Alright Sorcerers here are a couple of videos highlighting the animations of Wayne & Lanny’s Ornament Barrage! The first video was taken by our friends over at Attractions Magazine where it highlights the Level 1 Animation. The second video was taken by us this morning, showcasing both the Level 2 & 3 animations. Thus showing what the card is capable of when it is all powered up! My sincerest apologies that Move It! Shake It! Celebrate It! happened to be heading down main street at the time. Hope you still enjoy it! This afternoon the Disney Parks Blog has confirmed that Wayne and Lanny from Prep & Landing will indeed be featured on the Mickey’s Very Merry Christmas Party SotMK spell card. As previously reported guests attending the party must show their party ticket and wristband at the Firehouse in order to obtain the card. I am very pleased to see Disney release a photo of the card before the first party and I can’t wait to see it in action! Our friends over at WDWNT recently posted a map of Mickey’s Very Merry Christmas Party and it confirms that guests will indeed have the chance to receive an exclusive SotMK spell card. But who is going to be featured? Many have speculated Minnie, Goofy, Pluto, Scrooge, Stitch, and even Duffy. From what I’ve been hearing it will feature none other than Wayne & Lanny from Disney’s Animated Television Special Prep & Landing. I have been overhearing the possibility of this choice for quite sometime. Now as much as I would have rather seen a classic animated character these guys do make the most sense. 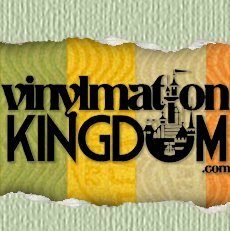 Given the release of the Prep & Landing Vinylmation Set this past Friday and the upcoming DVD release on 11/6 how can we expect anything less than that quintessential Disney Synergy! With November 9th being the first night of MVMCP I expect the distribution process to be exactly the same as it’s been at the Halloween Parties. The card will be given out at the Firehouse with a Wristband & Party Ticket required no exceptions. The cast of SotMK did a spectacular job distributing the MNSSHP card and I expect this go just as well if not better. So kudos to those who held on to their extra Chip N’ Dale cards in hopes of making a trade for another event exclusive. Your patience has paid off! More of the long-awaited SotMK merchandise has arrived, this time in the form of pins. The 10 Pin Mystery set ($13.95) & Master Sorcerer Badge ($11.95) have been spotted at the Emporium as well as Pin Central in Epcot. Both pins are open edition and I would expect to see them popping up everywhere in the very near future. The quality of the Master Sorcerer Pin is excellent, and a must for fans of the game. Although there is no timetable on when other merchandise will become available, I’d expect more in the coming months.